Overlooking the River Greta in the deepest depths of Co.Durham (formerly the North Riding of Yorkshire), sits the scattered - and partly restored - remains of Scargill Castle. Somewhat bizarrely for a historical relic, the most notable period in its long history probably belongs to the last couple of decades... when it was bought and given as a wedding present by one archaeologist to another! As is so often the case, this castle was never really a castle at all, but rather a fortified manor house. It was founded in the late 12th century by one Warren de Scargill, and would have amounted to a strong stone house (and a few other sundry outbuildings) within a small walled courtyard. As well as offering protection to Warren and his descendants, the local villagers could also be brought within the walls in time of trouble. … It was purchased by Niall Hardie-Hammond, the county archaeologist for County Durham, to be given by him as a wedding present to his wife, Caroline, who just happened to be the county archaeologist for Northumberland. It only cost him £100, but the substantial and prolonged period of renovation which followed cost them both a fair bit more. To cut a very long story short, the site was stabilised and made structurally safe, before eventually being properly restored - in medieval style - and opened as a holiday let in 2012. Scargill Castle does have a couple of ‘nearly’ claims to fame. 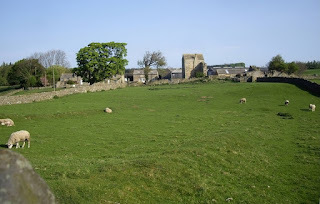 For years stories have circulated about an underground passage leading from the castle to Egglestone Abbey about three miles to the north (unsubstantiated); and for just as long it was thought that King Edward II had stayed there on his way north in 1323… but it turns out that he almost certainly hadn’t. Readers may remember that the castle featured on Channel 4’s Time Team in January 2009. You are such an artist at detailing. I would love to see this place. There are some really great places there. The gatehouse seems pretty grand.